The pieces I'm listing now are the extensive collection of a very talented lady in Tulsa who loved Christmas and decorated enthusiastically for many years. She has moved into assisted living and had to dispose of many of her treasures. 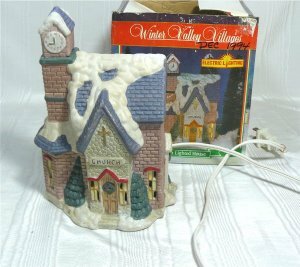 This sweet church is a lovely piece from the Winter Valley collection, done in pink brick and stone with a bluish roof. It has tall windows and is all decorated for Christmas. There is snow on the roof; the clock in the tower is probably saying that it's time for the Christmas Eve service. Just makes you want to go there! It measures 6" x 5" x 4" and is in excellent condition. It comes with its original box and has its own light cord with inline switch. Weighs 2 lbs. before packing. Every Christmas village needs beautiful churches...and this one will fit in nicely!